WHAT IS MORSE WATERWAYS ASSOCIATION? Morse Waterways Association (MWA) is a non-profit organization founded in May 2005 to serve the Morse Reservoir community. MWA supports the 1,400 homeowners living on the reservoir, the surrounding community and the weekend recreational boaters and fishermen. Our mission is to promote safety and the environment within the Morse Reservoir watershed which includes parts of Hamilton, Tipton and Boone counties. We are the organization that “Saved the Island” from further erosion. If you have not yet ventured to party island this year, you will notice a significant change since last summer. This project was completed over the winter. The concept to save the island which is owned by Citizens Energy Group was started over 2 years ago by our MWA Board of Directors. We developed the plan and worked with the former Indianapolis Water Company to obtain the necessary permits from IDEM and US Corps of Engineers and completed the project with Citizens Energy Group. Final cost of the project was approximately $22,000. All funds were raised through donations. 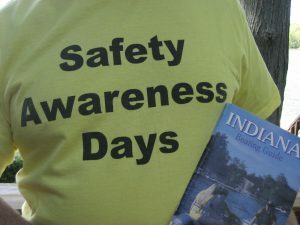 We are volunteers for our annual Safety Awareness Days during an early June weekend, dedicated to promote safe boating. 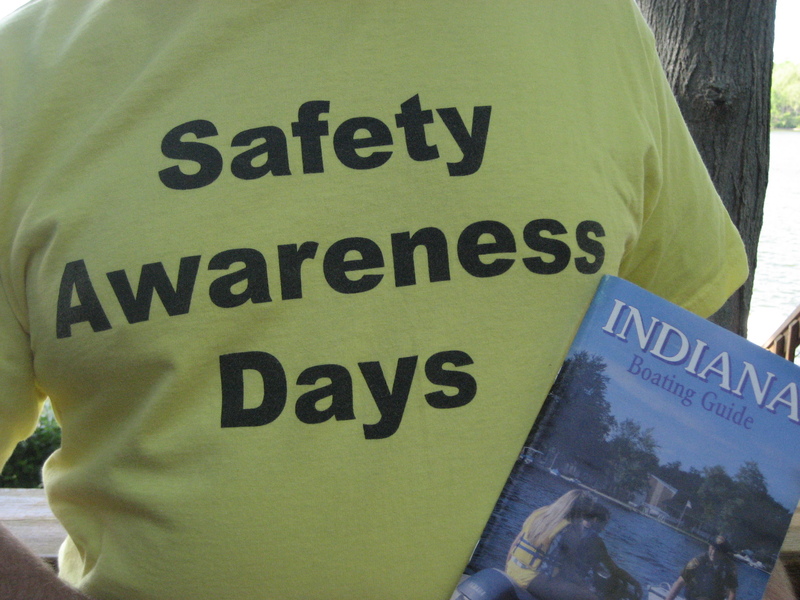 MWA volunteers at the marina boat launch ramp greet boaters and provide a copy of the Indiana Boating Guidelines. We remind boaters of a few safety regulations including life vests for everyone on board, sized to fit both small and large passengers. We are also the volunteers who each year haul tons of trees, trash and brush from the reservoir at our Annual Lake Cleanup. For the past 7 years, we have averaged 10-12 dump truck loads of debris with each annual cleanup effort. Our gratitude goes out to the towns of Cicero and Noblesville and to Hamilton County who assist with the cleanup and hauling away. Without these partnerships, we would not be able to accomplish this task each year. Browse our photo album for pictures of past events. Our cleanup efforts make for safer boating, tubing, skiing and fishing while helping to protect our boats and PWC’s from damage. We are the reason that our boat docks have numbers. Our association worked with the Hamilton County Sheriff’s department, and with Noblesville and Cicero fire departments to number the docks on the lake. MWA raised the $4,000 in funding and created the awareness on the reservoir to place numbered signs on docks around the lake. Initial discussions in 2006 with municipalities and agencies eventually led to implementation in 2008. Thank you to the sheriff’s department who worked directly with MWA and managed the project. Each dock has its unique dock number which is linked to the homeowner’s street address. If a boater is in distress, this system helps to identify the location on the water in case of emergency. Since the dock signs are linked to the home owner’s street address, emergency vehicles can respond by land or water for faster emergency response. We are the group that is concerned about water quality. Many articles have been written locally concerning the quality of the water at Morse, Geist and Eagle Creek Reservoirs. In 2008 we applied for a $47,700 grant from Lake and River Enhancement (LARE) through the Indiana Department of Natural Resources to conduct a study on water quality and prepare a watershed management plan for the Cicero Creek watershed. Cicero Creek includes the tributaries upstream which feed into Morse reservoir and downstream Cicero Creek feeding into the White River. This grant and study were conducted in partnership with the Upper White River Watershed Alliance (UWRWA) of which we are a member. The UWRWA has most recently been awarded a 319 federal grant from IDEM for nearly $600,000. These funds will support projects within 5 different watersheds. We hope to have a few projects funded by this grant which will have a positive impact on improving the water quality of our watershed and reservoir which address nutrient reduction and sedimentation. We worked with the water company to analyze the quantity of water being discharged from the reservoir during drought years. As a result, new automated valves were installed at the dam which minimized the water draw during critical drought seasons, eliminated the guessing of quantity of water needed for water plants and created a steady water flow release versus dramatic quantity flows. We coordinated with the Hamilton County Soil and Water Conservation District and the Hamilton County Parks Department to plant a rain garden at Morse Park. This is an example how to keep rain water from flowing directly into storm water sewers or the reservoir. The rain garden will help to reduce the nutrient load and pollutants entering the watershed and reservoir, thus improving the water quality.